The Inca Jungle trip in the Machu Picchu mountain range is manifested in lush, rugged landscapes, snow-capped mountains and dense foliage of the rain forest. 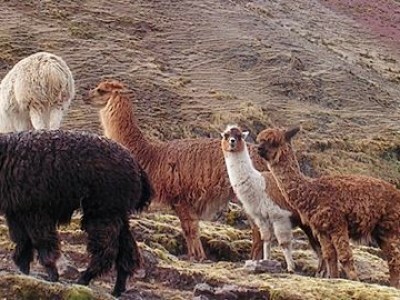 Imagine a multi-active tour where you are actually immersed in the authentic wilds of Machu Picchu’s wilderness. 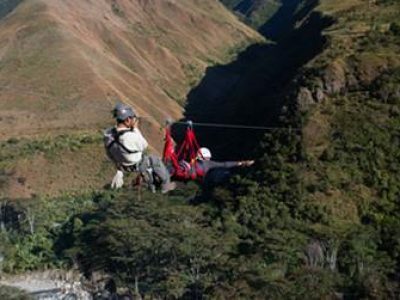 On our superb adventure, we bicycle from the Andean Mountains down to the rain forest, raft exhilarating whitewater in the Urubamba River, a world class 400 meters Zip-line and hike among cross valleys and ridges until the amazing complex of Machu Picchu and if you wish climb Huayna Picchu the highest peak behind Machu Picchu. The Inca jungle trip starts when our private vehicle will pick you up from your hotel at 6 am. The 3 hour drive follows one of the most breathtaking scenic hillside found along Cusco’s and Machu Picchu’s wilderness, including the highest pass Malaga (14,500 ft or 4,350 meters above sea level). Overlooks include charming Andean towns, the beautiful Sacred Valley with its ancient ruins, winding rivers, rough peak mountains and magnificent dense forest. At Carrizales its time to start the legs moving. After an orientation about the bikes and safety equipment you will test your bikes and skills, then it’s time to roll out the bikes. You experience an intense as long as you desire to go 2500 meters – 8202.1 feet downhill. The route follows a hilly paved road that connects the Andes to the Amazon jungle. The setting is unparalleled with colorful, lush wall forest in contrast to snow capped mountains elevated nearly 6000 meter – 19685.04 feet above. *If you wish to stop biking or feel tired, alternatively, you can join our support vehicle for a scenic drive until Santa Maria the end of the biking tour. If you need more action, our Inca Jungle offers a rafting option where you can enjoy the exciting whitewater rapids of the Urubamba jungle River, Cusco’s best rafting section for day tours. The Urubamba River is a fabulous stretch of great rapids, impressive scenery and warm weather. This river offers sections suitable for families, beginners, intermediate and advanced boaters. After the rafting tour ends, we shuttle to Santa Teresa, a client’s favorite place. Resting on a raised hilltop, the lodge is the perfect place to relax and enjoy the views or have a little hike to the Colcamayo hot springs located few minutes from the lodge. Meals Included: 1 lunch – 1 dinner. Time mountain biking: 3 to 4 hours. Time river rafting: 2 hours. Today we take a local bus for about 30 minutes to Lucmabamba, the beginning of the jungle trek. 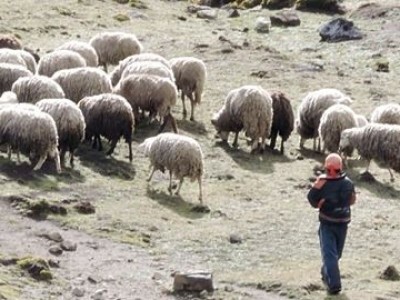 The scenery changes as you walk down a very well preserved Inca trail road. After about 3 hours walking uphill, we arrive at the complex of Llactapata (known also as Patallacta), which means “town of the hillside”, originally discovered the same time as Machu Picchu. There are many other Machu Picchu tours that will take you to see Machu Picchu, but you can only see this spectacular place from a different angle by taking the Inca jungle trip. At this location, your guide will give you a little tour around this place. It will take two more hours downhill until we reach Machu Picchu Hydroelectric, and after lunch we will walk for 2 hours 30 minutes until we arrive at Aguas Calientes (town below Machu Picchu). There is an option to take the train from Hydroelectric to Aguas Calientes, it takes 20 to 30 minutes, but the train ticket is not included in the trip price. (You can purchase a train ticket from Hydroelectric to Aguas Calientes for about $22 USD). At Aguas Calientes, we will check in to a lovely hostel for a nice warm shower and good rest. (1 breakfast-1 lunch-1 dinner). This is the most important day of the trip because we will finally see Machu Picchu. We recommend starting our trekking early in the morning. The idea is to arrive at Machu Picchu early so you can have the chance to climb Huayna Picchu or Montaña. *Note that the Inca Jungle tour doesn’t include the hike to Montaña mountain or Huayna Picchu peak. Both hikes are optional and they are subject to availability. Walking from Aguas Calientes takes 2 hours 30 minutes (more or less) to get to Machu Picchu. Our guide will take you around the area for a two-hour guided tour of the wonders of this impressive complex. Machu Picchu citadel is located only about 80 kilometers (50 miles away) from Cusco but was never found by the Spanish conquistadors and consequently not devastated as was the case of other Inca cities. Over the centuries, the jungle grew over much of the site, and only a few knew of its existence. However, on July 24, 1911, Machu Picchu was discovered by Hiram Bingham. After the guided tour, there will be plenty of time to take pictures, walk around the places that we like the most and then meet up with the rest of the group at Aguas Calientes to catch the train to Ollantaytambo. 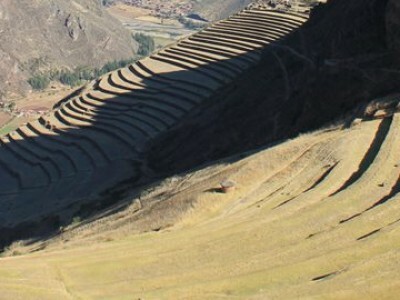 Transfer from Ollantaytambo by our private bus to your hotels in Cusco, and say good bye to 3 fantastic day of adventure. One night simple accommodation, 1 night hostel. Two breakfasts 2 lunches and 2 dinners. Entrance fees to Machu Picchu, we recommend to ask about the availability to enter Machu Picchu complex before making any payments, for more information, read Machu Picchu tours – Rules and Regulations. All biking gear with suspension and disk brakes, helmets, knee and elbow protection. All rafting equipment including type V life vest, helmets, paddles, boats safety kayak or safety kararaft. First breakfast, last lunch and dinner in Aguas Calientes (day 3), bus tickets from Aguas Calientes to Machu Picchu and entrance fees to hot springs in Santa Teresa or Aguas Calientes, entrance fees to Huayna Picchu peak or Montaña mountain, train ticket from Hidroelectric station to Aguas Calientes. Hiking shoes, mosquito repellent, couple of t-shirts, hat or cap, swimsuit, towel, sandals, shorts, camera, things you consider necessary during this Machu Picchu tour. Our standard price includes s 3-star hotel at Aguas Calientes (Machu Picchu city) and lodging at Santa Teresa town. Our tour is based in a double bedroom. If you desire to have your own private room, surcharges applies. Available 4 and 5 stars hotel at Aguas Calientes, ask for prices and information. Choose a day and we start from there. Two people is what we required to guarantee a departure.